How to hang curds?Well,it is very simple.Even I wasn’t aware until few years back.I used to panic when I used to see in the recipe that called for hung curds.My answer question would be whats that aba?.Hung curds can be used to prepare the famous Maharashtrian dessert Shrikand by adding flavors to it.Hung curds is also the substitute for cheese dip.You may also use it to prepare Tzatziki too.I know this is a very basic recipe but I feel it would be of help to a newcomer….Hung curds are most commonly used in tandoori or tikka dishes…I will add many Information in HOW TO? etc etc in the coming days.I have been suggested by my well wishers also…So today I will show tell you’ll how to hang curds?Since I thought about this post just now I don’t have many pictures,I will update it soon, stepwise. So until then hope this will be of some help. 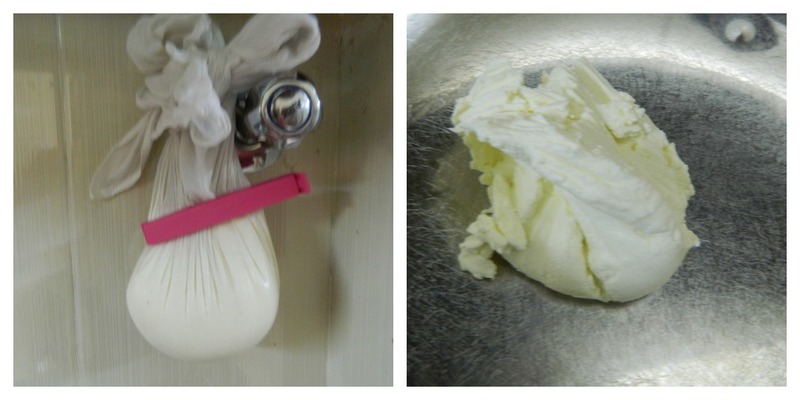 Transfer the curds into the centre of the muslin cloth. Tie it tightly with a ribbon or a clip. Hang it over the place where there is height for nearly 5-6 hours until the water stops dripping completely. You will get a dry crumble like cheese or paneer,and that is the hung curds. You may use it as sour cream by adding little salt and a dash of lime. You may also take a vessel,keep a strainer on the vessel,add curds,assemble the cloth together and tie it,if you are doing it for the first time. I hang the curds just above my sink where I luckily have a provision to tie and the dripped liquid directly goes into the sink.